The Circle of Trust: Sticking to Your Own Kind — UniPro | Pilipino American Unity for Progress, Inc.
“You are the company you keep,” as the popular saying goes. The people in your circle of friends are a reflection of you, and you of them -- not just personality-wise, but often times physically... and in turn, culturally. I might be generalizing too much here, but I feel that most people tend to “stick to their own kind” when it comes to their best friends. For the record, I don’t think any Pilipino makes a conscious manifesto to only be best friends with other Pilipinos, nor do I think that white people or black people do the same. I think that certain elements cause that to happen -- things like your geographic location, whether or not you were close with your family, etc. Now don’t get me wrong. There are a handful of people I know (myself included) who definitely stick out like a sore thumb in their group of best friends. For example, one of my good friends, Andrea, is Colombian-American and it has been a running joke that she collects Pilipinos for friends, as many of us who are her closest friends are of Pilipino descent. I’ve reached the point in my life where everyone around me is getting engaged and married, and I’m just over here thinking, “I can’t wait to binge watch Veep in front of my laptop because I can ugly-laugh and eat in front of it all I want!” I go to the weddings; I see the photos. White bride, white groom, white entourage. 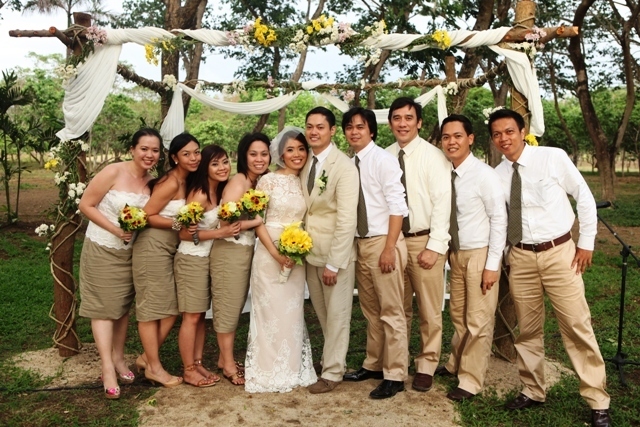 Pilipino bride, Pilipino groom, Pilipino entourage. Black bride, black groom, black entourage. Well, other than the fact that my wedding would probably be unconventional right off the bat, I think my entourage side would look a little like it were a United Nations General Assembly group photo. No lie. And note, I didn’t say an ASEAN group photo. In fact, for the sake of this blog post, I imagined that I was getting married today (...because that’s not awkward at all) and made a list of who would be standing next to me. I came up with nine people. Only two of them are Pilipino. Insert gasp here. So if it’s the norm in society, why don’t I have all these Pilipinos around me as my best friends? Well, for starters let me reiterate that in no way am I saying that I’ve failed in not having only Pilipinos as my best friends, nor do I feel that others should and always do stick to their own kind. A few concrete reasons come to mind: geographical location and where I studied. Had my family stayed in the Philippines and not moved to the States when I was younger, then yes -- my best friends today would probably be all Pilipino for obvious reasons. My family (thankfully) settled in New Jersey a stone’s throw away from New York City in a town that did not have a large Pilipino community. As a result, I grew up in a public school system that gave me the opportunity to be in class with every color in the box. I was in a youth group that was predominantly comprised of Pilipinos, but I didn’t quite find my best friends there. When it came time for college, I decided to attend a university in Long Island that was 63% white, 7% Asian (and out of that Asian percentage, probably about .5% Pilipino). My college had no Asian Club, let alone a Pilipino Club. My two best friends from home - German and Angela - are not Pilipino. German is Ukrainian-Israeli American and Angela is Peruvian-American. We are the children of immigrant parents. We speak the language of our forefathers. They may not be my Pilipino best friends, but in a way - they are. They understand what it’s like to grow up as the different one; they honor the sacrifices their parents made in facing the unknown and moving their families to a new country; they appreciate traditions and respect culture. They take their shoes off when they come to my parents' house. Here we are purchasing cupcakes for my pretend wedding. My closest friends may not be my own kind culture-wise, but they are my own kind personality-wise. Friendships are based on experiences and emotions. And for most people, it just so happens that they are cut from the same cultural cloth. I don’t have any glamour shots of my best friends and I taken in swanky studios circa 1998, but I do have vodka shots ready for them when they do finally take their place next to me on my wedding day. Oh wait, I forgot that was just a pretend wedding. Nevermind.